Sugar Pine Cabin is located in the beautiful Torreon Country Club. This luxury wooded mountain retreat is in Show Low, Arizona, at a wonderful golf resort community called Torreon Country Club, under 3 hours from Scottsdale. Close to SUNRISE SKI AREA. Sugar Pine Cabin is just a short walk to the main clubhouse, golf shop, family center complex, fitness center, swimming pool and jacuzzi. Sugar Pine Cabin is unique with mountain décor. Front deck with sunset views, and large rear deck has gas grill with table & chairs and a separate sitting area. The home has a fully equipped kitchen with dining island for two and a dining table seats six. Wi-Fi and Laser fax/printer are provided. Digital cable provided with flat panel televisions. All rooms with TV and DVD. Kitchen with stainless GE Profile appliances. The master suite has a lodgepole King bed with and opens to rear deck. Bedroom two has a Queen bed. Bedroom three has two Twin beds. During your stay, you and your immediate family members will be Designated Unit Golf Members, with full access to two 18 hole championship courses. The Clubhouse serves a wonderful breakfast, lunch and dinner. The Bar & Grille has a nice fireside happy hour. The Cabin Lodge is open for lunch and dinner, experience a wonderful meal with a rustic lodge atmosphere located within the Torreon community. Beautiful cabin close to Clubhouse, Golf, and Family Center. Country Club amenities with Unit Golf Membership included. Two 18 hole championship courses with Practice Facility. During your stay, you and your immediate family will be Designated Unit Members with full access to the Torreon Country Club and amenities. Golf Rates: Designated Unit Members: $20 cart fee/person. 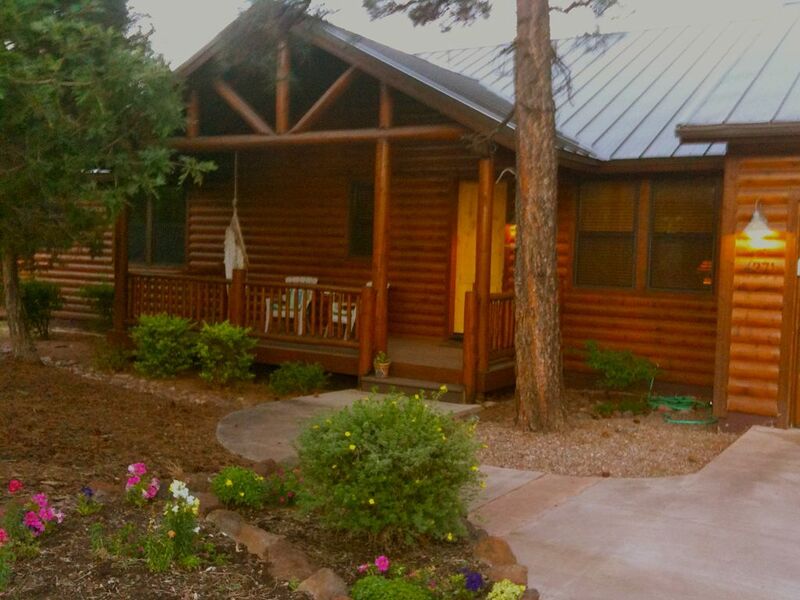 Our family of 4 enjoyed our stay at this cozy cabin in Show Low. It was snowing while we were there and it was great to cuddle up by the fire and watch it snow out the windows! It was a perfect home for a family summer get-away! We truly appreciated the cleanliness of the home! Our family of 5 had plenty of space. Having the golf memberships as part of the package was a benefit, as we love playing both beautiful Torreon courses. Our family enjoyed riding the bikes around the community, swimming at the pool and dining at the club. All the amenities the home had to offer worked well for us! We had a wonderful two-week stay in this very comfortable, well equipped home! My wife and I took our two kids, ages 5 & 8, up to the high country for a week during winter break. It was a lot of fun. Torreon is a great community with a lot of nice amenities and the people who live there are very warm and inviting. It's beautiful in this area and there is plenty to do in the Show Low and Pinetop-Lakeside area. The cabin we stayed in was perfect, with everything we needed. The owner was very responsive and helpful. I would highly recommend it. Two 18 hole championship courses with Practice Facility, Tennis Courts, Community Center, Family Center, Fishing pond. Family Center Complex with complimentary game room (arcade games, air hockey, pool table, ping pong) Movies, planned activities, basketball and volleyball. Golf Facility with 2 hole practice course, range, and golf camps. Tennis courts with lessons. Equestrian Center. Holidays: add $50/night for Christmas Break, New Years, Thanksgiving, 4th of July, Memorial & Labor Day Weekend.